The city of Cabo de Santo Agostinho is distant 41 km from Recife and is place of the biggest industrial pole of Pernambuco and of a wonderful scenery of beatiful beaches. 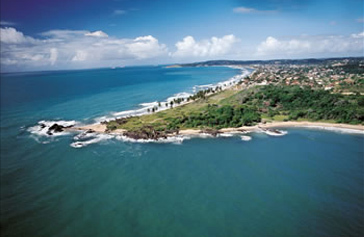 The name, Cabo de Santo Agostinho, means Cape of Saint Augustine. It offers to visitors options of ecological reserves, mangroves and some of the most beautiful beaches in Pernambuco, such as the beaches of Calhetas, Paraíso and Gaibu. These beaches attract people looking for tranquility as well as those looking for nautical sports. Besides the beaches, the historical monuments also attract tourists to Cabo. Ancient sugar cane mills (in Portuguese called "engenhos") are still operating in the city, some open to visitations; special care is taken to preserve the History of such places. Among the historical buildings, one can visit the Igreja de Nossa Senhora de Nazaré (Nossa Senhora de Nazaré Church) and the ruins of the convento carmelita (carmelita convent), wich dates back to late 16th century years, and the Forte Castelo do Mar (Sea Castle Fortress), built in 1631 by the Portuguese utilizing granite of the region, in an attempt to protect the area form the Dutch invasors.